separated vertical rows of leaf scars with no raised cushions, whereas leaf bases in Clathraria are closely arranged. Most sigillarians must have been rather unusual looking plants with little distal branching and a large number of closely spaced, elongated leaves arising from the top of the trunk. Sigillariophyllum and Sigillariopsis leaves are similar to those of Lepidophylloides except that they may be vascularized by two laterally flattened strands instead of one. 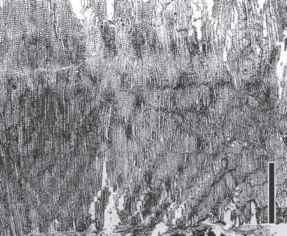 On the lower surface are two longitudinal grooves lined with conspicuous trichomes. Stomata are arranged in rows, and the guard cells are sunken. Cyperites is a morphogenus used for isolated linear leaves, usually < 1 cm wide, which are butterfly-or X-shaped in transverse section (Rex, 1983) and generally thought to represent compressed sigillarian leaves (Doubinger et al., 1995). 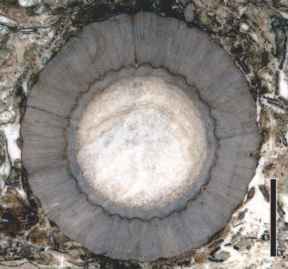 Although the exact reason for the configuration in cross section is not clear, it is suggested that the two abaxial grooves may have contributed to this morphology. figure 9.87 Transverse section of Sigillaria approximata stem (Pennsylvanian). Bar = 1 cm. xylem is produced, and it consists of scalariform trac-heids and narrow vascular rays. Distribution of cortical tissues is similar to that described for Diaphorodendron, and tangentially banded periderm is common in these plants (FIG. 9.88) ; the periderm often contains concentric bands of presumably secretory cells. In addition, tangentially expanded cells form distinct clusters that appear spindle shaped in transverse section. Extending radially through the periderm are pairs of cylindrical to laterally flattened strands of parichnos tissue that can be related to the parichnos scars on the leaf bases and that may have functioned as an aeration tissue. Sometimes Sigillaria is found in a partially decorticated state called Syringodendron. The outer surface exhibits vertical rows of large, often double elliptical scars that resemble rabbit tracks. These scars represent the parichnos strands as seen in tangential section, at a level of stem decortication. 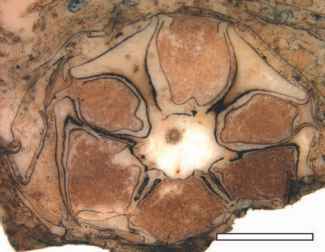 Underground organs of Sigillaria are similar to the stigmar-ian system of the other lepidodendrids, but there are a few anatomic differences (Eggert, 1972). 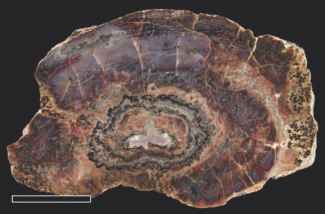 In stigmarian axes of Sigillaria, the pith is relatively narrow in proportion to the diameter of the stele, and consists of an outer zone of mixed tracheids and parenchyma and a central zone of parenchyma. The cortex is also narrow and consists of two primary zones. Secondary cortical development involves concentric rings of meristematic cells in the outer cortex, whereas in the underground parts of Diaphorodendron, periderm was produced from a single, central meristematic layer. In the lateral appendages (rootlets), the connective is continuous, unlike the organization in Stigmaria. The genus Stigmariopsis is known to have been the underground part of some subsig-illarians and is distinguished from Stigmaria principally on the basis of unequal branching in which the smaller branch is directed downward (Eggert, 1972). figure 9.89 Longitudinal section of Mazocarpon oedipter-num cone. Arrow indicates megasporangium with megaspores (Pennsylvanian). Bar = 5mm. absent. Eggert (1972), in turn, detailed the nature of the sigil-larian underground system from an Upper Pennsylvanian site in which Sigillaria was present, whereas the other arborescent lepidodendrids were not, thus making it possible to correlate the aboveground and subterranean parts of the same plant even though they were not organically attached. 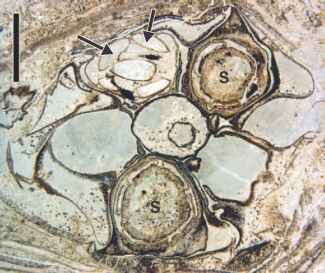 figure 9.90 Transverse section of Mazocarpon oedipternum megasporangiate cone showing parenchymatous subarchesporial pad (S) in two sporangia. Note megaspores (arrows) between pad and sporangium wall (Pennsylvanian). Bar = 3 mm. figure 9.91 Transverse section of Mazocarpon oedipternum microsporangiate cone (Pennsylvanian). Bar = 5 mm. 1983). In this species, only immature megaspores have been found in apical sporangia. 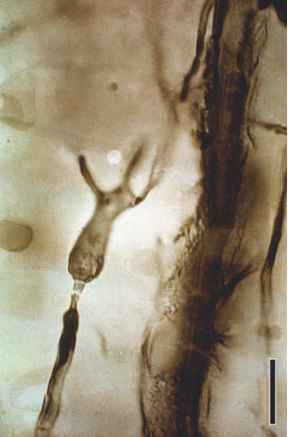 Megagametophytes have been described in several species of Mazocarpon; these consist of prothallial tissue with rhizoids and archegonia up to 65 pm long, each with three tiers of neck cells. Reproductively, the sigillarians are far more complex than originally thought. Pigg (1983) suggested three different types of megaspore dispersal in the genus. In one type, exemplified by Mazocarpon villosum. spores are believed to have developed rapidly and then been shed from the sporangium. In another type, for example M. oedipternum, the sporophylls are retained on the cone at maturity and the megaspores were dispersed (some with megagametophytes) when the spor-angial wall broke down. This contrasts with M. pettycurense and M. cashii, which are hypothesized to have dispersed megaspores with their attached sporophylls by fragmentation of the cones. The presence of megaspores containing embryos embedded within the intersporangial tissue of the megaspor-angium has been used as evidence to suggest that apomixis occurred in this group (DiMichele and Phillips, 1985). A small amount of sterile tissue has been described in the microsporangia of M. bensonii (Feng and Rothwell, 1989). In this species the trilete microspores range from 48-54 pm and the sporoderm is constructed of a dense reticulum of interconnected rodlets. 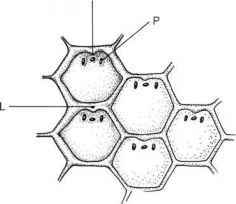 This sporoderm organization is similar to the fine structure of the megaspore wall reported in M. oedipternum (W. Taylor, 1990). 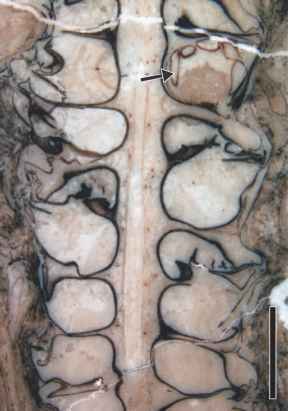 Sigillariostrobus is a compressed cone believed to have been produced by sigillarian lycopsids. Many of the species described to date may represent preservational states of the Mazocarpon-type cone and have been correlated with the latter on the basis of size, organization of the spo-rophylls, and morphology of the spores. Some specimens of Sigillariostrobus may attain lengths of 30 cm. Despite the advances in recent years, there is still much to be learned about the biology of sigillarian plants. They represent one of the arborescent lycopsid groups that flourished during the Late Pennsylvanian. The sigillarians are believed to have inhabited near-swamp environments that were slightly drier than those dominated by the other arborescent lycopsids (DiMichele and Phillips, 1985).